In October 2015, Susie gathered a group of vendors from Copper Country Antique Mall that was closing. Many were long-time dealers who wanted to try something new. The concept of opening a mini-mall geared toward vintage, décor, antiques and a sprinkling of keepsakes took hold. They worked diligently creating the Tinkertiques atmosphere. An open concept of pickets, arbors and nooks began to take shape under the hammer and saw of vendor Bob Sticht. Once the structures were complete, each and every vendor went to work with burlap, paint and trim. On December 1, 2015, the shop opened. Outside is a sampling of the interior. On one side of the entrance, two vintage green motel chairs sit on an old wood platform. A large asparagus fern nestles between them. On the other side of the door is a small display of plants, buckets and planters. Susie explains that the outside displays change regularly since most everything is for sale. A chalkboard sign at the door, scripted by Becky Ward, one of the vendors, asks that you “come in and stay awhile.” It is an invitation that is hard to resist. The vendor offerings vary. Marian Flores loves her shabby chic arbor of lace, roses and gilt. Jay and Jeannie Marks display items from toy guns and western ephemera to oak furniture and glass collectibles. Becky Ward is everything “garden” while Bob and Carla Sticht focus on primitives, furnishings and a touch of the elegant. Walter Willett IV is the resident military aficionado. 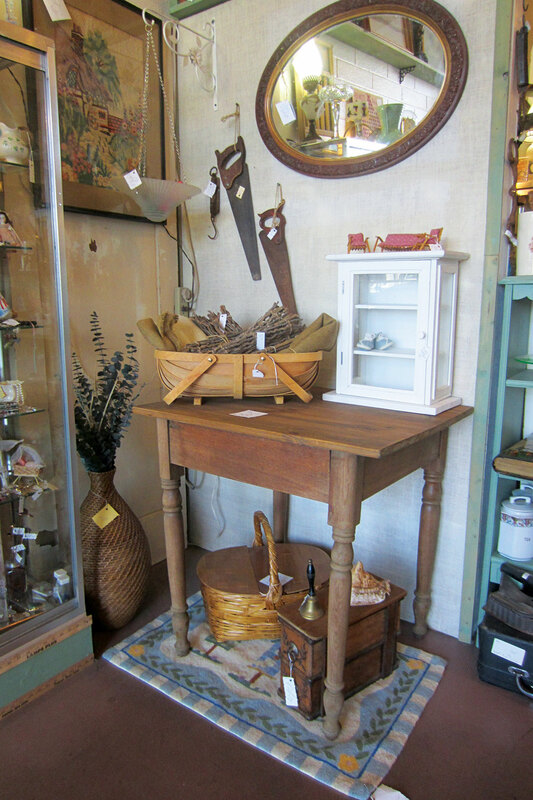 Sue Crouse displays retro and vintage everything while new vendor Mark Pagels concentrates on the eclectic. Susie Frei says that her part is to fill in the blanks with a kitchen and parlor booth. The very size of Tinkertiques makes it different from the other malls. The shop is about 1500 square feet, chock full of displayed merchandise. The mall works on a cooperative basis with each vendor working behind the counter or for the shop in some manner. Each vendor pays rental space with no commission and no additional dealer fees. Susie says, “It is extremely helpful to work in the shop a couple of hours a week. We learn so much about our customers and it allows vendors to discuss display.” The decorative influences are obvious as the shop blends well from space to space. If time allows, vendors may work their booth while working in the shop. Others may build shelving, change bulbs or trouble-shoot technical issues. Shop practices are directly related to customer requests, such as a recent one regarding wrapping. This past holiday season it was decided to use gift bags and boxes—an old practice that is not common any more—and customers loved it. A year in business, the shop is growing. Moving a showcase made room for another vendor space and the shelving is being completed. Before summer, overhead lights will be changed and the painted floor carpets will be refreshed. Perhaps best of all—the inspiration continue. To learn more, Like or Follow Tinkertiques, LLC, on Facebook, email sfrei82776@aol.com or call 520-327-0379. As a vendor in Tinkertiques, Patricia Burris brings in the rust, rustic and glassware. Patti is a freelance writer/artist residing in Cochise County. She is the former editor of Ghost Town Trail News and has owned and operated antique shops in southeastern Arizona. Currently, the renovation and restoration of the Pearce Mercantile—a Spanish Territorial building on the National Historical Registry in Pearce, Arizona– occupies her interests.